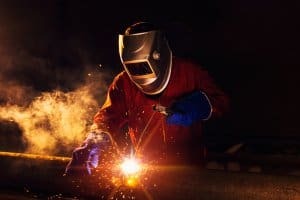 Is all steel the same for steel pallet manufacturing? Steel is, has been and will remain the backbone of countless industry and manufacturing operations as its high strength, durability and relatively manageable cost make it the ideal material for so many applications. 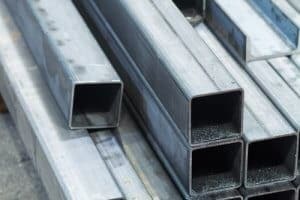 Although widely used for everything from ships, buildings, cars and knives, there are many different grades of steel each with their own properties and compositional features. We manufacture custom steel pallets for a range of industries at our Dewsbury factory and have done since 1979. We know that regardless of who our clients are, our steel pallets need to be of the highest possible quality and use the best steel available. Oxygen Furnace – Coke fuel is poured into a furnace which ignites it by blowing hot high-pressure air in an upwards direction. This created temperatures of up to 16,00 degrees at which point molten iron ore is poured into the furnace. The oxygen contained in the hot air current causes chemical changes in the iron ore and removes impurities like phosphorus, silicon, manganese and carbon. The result is low carbon steel that is of high purity and ready for use in products such as our steel pallets. There Are Different Types Of Steel? 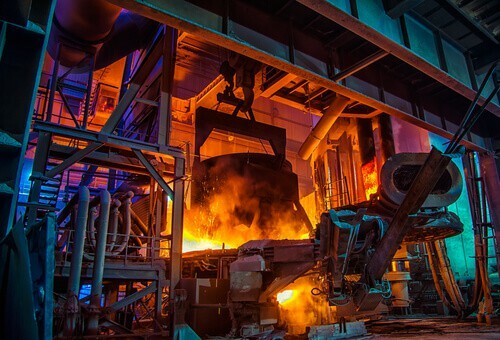 Carbon steel is made from fusing iron ore and carbon together in the smelting process. The consequence is a harder material which is often used in knives or products that undergo very intense use. The intense hardness, however, makes carbon steel more likely to shatter as it isn’t as malleable as other forms of steel. It is also known to rust and not perform too well over time which would make it unsuitable for steel pallets that are exposed to weather and wet conditions. Alloy Steels include controlled amounts of other metals in order to make the steel more corrosion resistant, malleable and weldable. This is the type of steel we use at Range Storage to construct our custom steel pallets as it allows us the flexibility of manufacturing customised designs but also the toughness and resilience pallets to endure years of use. 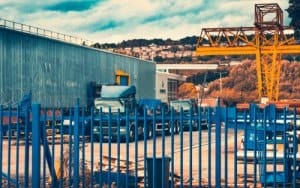 Why Do We Use British Steel? The durability of alloy steel is totally reliant on how many impurities you can eliminate during the smelting process. The focus and standard of the smelting production process must be of the highest quality. Producing alloy steel is somewhat of an art as each alloy must be added in the correct quantities so that the steel is as hard as it can be but also shock absorbent and adaptable. It is for this reason that Range Storage insist on using British manufactured steel as it is highly regulated and renowned for its quality and perfect composition. For example sulphur, a very harmful impurity that makes steel brittle should make up no more than 0.015% of a batch of good steel. In some foreign imports, it is not uncommon to find sulphur levels as high as 0.06%. Our steel pallets are versatile, tough and reliable. Unlike many companies that manufacture a set of generic pallet sizes, we prefer to start by listening to our customer requirements and working with them to design and build customised steel pallets suited to their unique demands. We ensure quality by keeping the entire process from design to powder coating in-house at our Dewsbury factory. By having full control over every single process, we can consistently deliver steel pallets that will not let you down regardless of stress, heat or weather. We are CHAS approved and hold the ISO 9001 certification as well as being ROSPA compliant so you can be sure that our steel pallets will consistently exceed expectations. To find out more about our high-quality British made steel pallets enquire today!